Paddlers are flocking to Old Forge with the good weather. Clearly, the word is out. “Through-paddlers” on the Northern Forest Canoe Trail are launching from the Trail’s Western Terminus at Old Forge Dam on a regular basis, joining whitewater rafters and kayak fishermen for the spring season. Emma Carlson and Emily Rooney begin the Northern Forest Canoe Trail in Old Forge, April 2013. “Through-paddlers” are people who paddle the entire 740-mile route from Old Forge to Fort Kent, Maine. 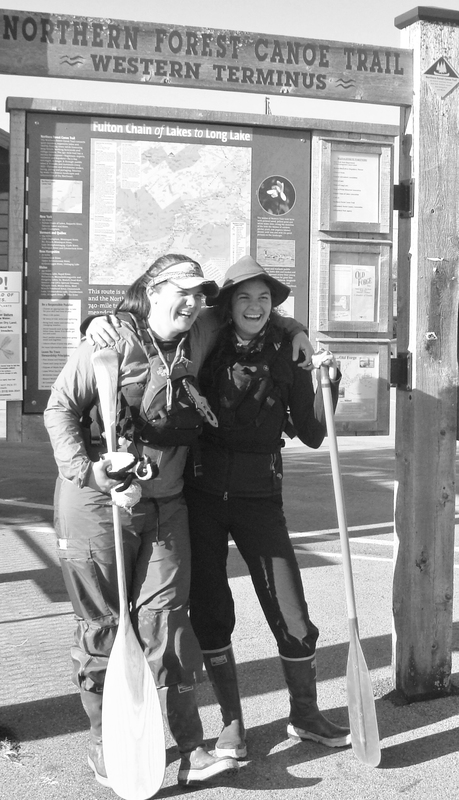 In 2013, Emma Carlson of Maine and Emily Rooney of Vermont fulfilled their ambition to be the first through paddlers of the season. They launched on April 23rd with cold weather gear and ice axes, because some lakes were still iced over. They held to their schedule, dragging their canoe across frozen water where necessary. The Northern Forest Canoe Trail, organized in the 1990s, connects the major watersheds across the Adirondacks and Northern New England. Old Forge, the western terminus of the Trail and the unanimous starting point, is the official Trail Town for New York State. Paddlers follow traditional water routes developed by Native Americans and guides to Lake Champlain, then on to Vermont, Quebec, New Hampshire, and Maine. The Trail links 45 communities and wild places, including three national wildlife refuges, offering canoeists and kayakers adventures through flat water and whitewater in 58 lakes and 22 rivers. Paddlers find overnight options from primitive campsites to country inns about every 15 miles. This year, Matt Blodgett of Driggs, Idaho, and his partner, Matt Bowler of Falmouth, Maine were the first through paddlers to launch. They started from Old Forge on Sunday, April 27th. The sun was shining and there was hardly a black fly in sight on Thursday, May 8 when Jeff Loustaunau of Maine and Dan Brown of Vermont began their trip on the Trail. Former classmates at the U.S. Naval Academy, the pair expected to greatly bolster their somewhat limited experience as paddling partners. Jeff Loustaunau of Maine and Dan Brown of Vermont launch on the Northern Forest Canoe Trail Thursday, May 8, 2014 with their wives and Ruby the Retriever looking on. Warming rapidly in long sleeves, Loustaunau lamented not having his son, a Navy Seal deployed to Afghanistan, accompanying him. In addition to his normal concerns, he added that his son could carry the boat and all their gear across the portages by himself. On Sunday, May 12, Graham Conway and Alex Drexler from Boston slid their boat into the waters of Old Forge Pond early Sunday morning. 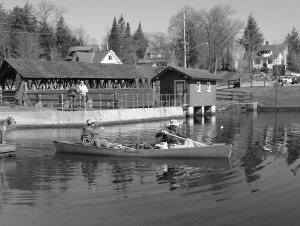 They had heard about the prominence of Old Forge among paddlers, and decided the Trail should be their spring adventure. They were excited about returning to Old Forge to sample the many local paddling options. The quiet waters of the Old Forge Pond welcomed Eric McIntyre and Laura Stasi of New Jersey on Wednesday, May 14 on the start of their Trail journey. Students at St. Lawrence University, they were inspired by Emma Carlson and her 2013 Trail excursion. 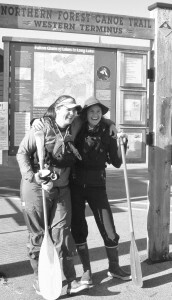 Carlson was an instructor at St. Lawrence, and Stasi and McIntyre participated in Carlson’s Outdoor Recreation program. 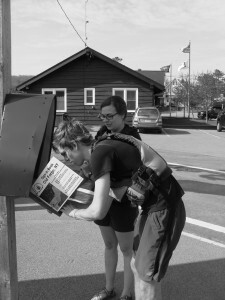 Because of time constraints, Stasi plans to paddle the first three days with McIntyre, who will then complete the Trail solo from Saranac Lake to Fort Kent. The first part of the Trail follows the route of the Adirondack Canoe Classic “90-Miler” from Old Forge to Saranac Lake. The Northern Forest Canoe Trail is the premier long distance paddling adventure in the East. Old Forge, in turn, is now renowned as the “Paddling Capital of the Adirondacks” due to the variety and popularity of paddling options in the area. Given the availability and accessibility of waterways here, it’s only natural for Old Forge to rise as a mecca for paddlers. Whether plying the quiet waters of Big Moose Lake, Stillwater Reservoir, or the Moose River, following the historic blueway of the Fulton Chain Lakes to Raquette Lake and Blue Mountain Lake, riding the world-class whitewater rodeo of the Lower and Bottom Moose River, or paddling with the loons on countless area ponds, paddlers find themselves home. Paddling events such as Adirondack Paddlefest, the 90-Miler, and the Kiwanis Paddle Classic, as well as SUP Board Yoga and River & Rail excursions have made Old Forge and the Central Adirondacks the number one go-to option for paddling. Additionally, the world record setting One Square Mile of Hope on Fourth Lake in Inlet has shined a national spotlight on the region. Written by: Mike Farmer on May 15, 2014. Last revised by: Gina Greco, our reviewer, on May 22, 2014. This entry was posted in admin and tagged northern forest canoe trail, paddlers on May 15, 2014 by Mike Farmer.